Should I Head to the Gym in the Morning or After Work? If you are dedicated to getting off the couch and fitting some sort of exercise into your busy schedule, experts agree, whenever you work out, you are heading in the right direction. 75 minutes (1 hour and 15 minutes) per week of vigorous aerobic activity. 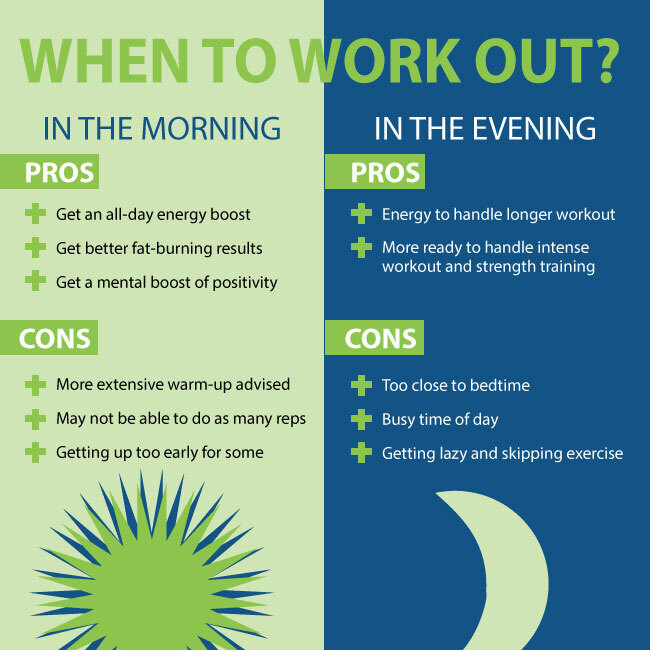 So, should you plan on waking up an hour early to head to the gym? Or, pack your workout gear and head to a spin class after work? Fitness experts and physicians say this group may benefit from an all-day energy boost by opting to work out early. Additionally, your body may be better ready to burn fat in the morning when you have less sugar in your system to burn first. The mental gains of an early morning workout have been frequently touted as a way to clear your mind and start the day on a positive note, which is why most Fortune 500 CEOs work out in the morning, according to www.fastcompany.com. On the down side, a more extensive warm-up is advised first thing in the morning to prevent injuries. When you’ve been up and moving all day, your body may be better prepared to handle a sweat or strength-training session, physicians say. Plus, you have more fuel in your system from meals and snacks throughout the day to fuel your energy level and keep you going. On the down side, beware of exercising too close to bedtime. According to helpguide.org, moderate or vigorous workouts should be timed at least three hours before bedtime. But, in general, studies have shown that any exercise has the potential to help you sleep better and get the rest your body needs. Although there are benefits for both morning and evening workout sessions, fitness experts say personal preference and consistency are the most crucial factors to ponder. For example, if you are not a morning person, will you really stick with a plan to get up early every day to go running? If your best efforts fizzle out after Day 2, you are better off joining an after-work exercise class that you’ll stick with. Location: Is your gym on the way to work? Time of day: Are you a morning person who gets a burst of energy all day after a workout? Type of physical activity: Are you doing strength training that requires more fuel (food) in your system than an early morning protein shake can give you? Social factors: Do you have an after-work running buddy who will help keep you motivated? In the evening, jump on the treadmill for 10 minutes as you process your thoughts from the day and plan ahead for tomorrow. Whether you run 2 miles in the mornings or walk a few times around the block in the evenings, every step is one in the right direction toward building a healthy lifestyle.